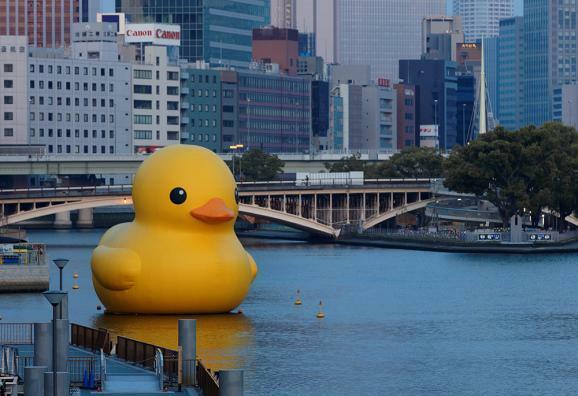 Just How Big is that Giant Floating Rubber Duck? Artist Florentijn Hofman's giant floating rubber duck will make its way to Pittsburgh Friday as part of the International Festival of Firsts. Artist Florentijn Hofman's Rubber Duck Project will float down the Ohio and Allegheny Rivers Friday, kicking off Pittsburgh’s Festival of Firsts. The duck has been on display all over the world, with stops in Amsterdam, Lommel (Belgium), Osaka, Sydney Harbour, Sao Paulo and Hong Kong. It's also spawned some counterfeit quackers. Now the real deal is set to make its American debut. Before you check out the project — or its bridge party — here’s some answers to questions you may have had about the giant runner ducky. The duck is 39 feet tall and is made from 5,000 square feet of PVP-coated vinyl fabric. The duck will start from near the West End Bridge Friday and will follow a path down the Ohio before passing the Point and turning on to the Allegheny. The duck will be moored near the Sixth St. Bridge throughout the bridge party (until about 10 p.m.), after which time it will move to its home just off of Point State Park. It will remain there until Oct. 20. Recommended viewing points vary depending on your choice of backdrop and the time of day: Point State Park has a good view of the North Shore and the sunset, Mount Washington offers a beautiful view of the city or the sunrise, and the North Shore will be a good lookout point if you want to see the fountain in the background. The duck will be guided by two boats: it sits on a pontoon, and it will be pulled by another boat. To keep the duck inflated, a large fan and generator are kept inside. Pittsburgh earned the duck over other American cities because, “In general, Pittsburgh is a great place," said Pittsburgh Cultural Trust spokeswoman Shaunda Miles. "The city experienced a 30-year transition, and it has done well and had great success. We are a city with a great cultural presence.” Credit was also given to the Pittsburgh Cultural Trust’s VP of Programming Paul Organisak and Cultural Trust President Kevin McMahon for their work. What's next for the duck? The duck’s next destination after the Steel City is unknown, but Pittsburgh has exclusivity for three months following the duck’s debut, so don’t expect to see him popping up in other cities in the near future.